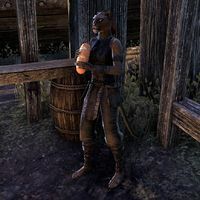 Eilara is a Khajiit outlaw found in the port town of Alten Corimont. She's in the makeshift camp under Ottaesa's Imports, along with fellow outlaws Mazilbin and Terezeeus. "No, these breads are Eilara's! No stealing!" This page was last modified on 7 October 2017, at 01:53.